Work has begun on the West Gate Tunnel, Victoria’s long overdue alternative to the West Gate Bridge, according to the Victorian Government. Workers have started clearing a site on Whitehall Street in Footscray, where they will dig down more than seven storeys, clearing the way for the projects two massive tunnel boring machines (TBMs). 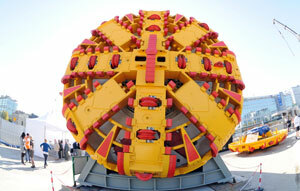 The two TBMs will be launched in 2019 and tunnel towards the West Gate Freeway, moving nine metres per day. As the TBM bores through the earth, it will install a concrete lining behind it – forming the walls, roof and base of the tunnel. Construction crews following behind will work to build the road surface and install electrics, ventilation and safety systems. Another work site will be established on the other side of Somerville Road later this year, with the two sites connected by an elevated heavy-duty, covered conveyor belt. The conveyor will transport dirt and rock from the TBM excavation to large sheds, to be loaded onto covered trucks and removed from the site. The two sites will be home to more than 500 workers – part of 6000 jobs created on the project. More project sites will be established in the inner west over the coming months as work gets underway to widen the West Gate Freeway and move utilities including gas pipes, sewers and drains to make way for the tunnel. The West Gate Tunnel will reportedly open in 2022. “This site will be a hive of construction activity for the next five years as we build this vital alternative to the West Gate Bridge,” said Minister for Roads Luke Donnellan in the statement. “We’ll be keeping the community informed every step of the way, doing everything we can to make things easier for locals during construction,” he said.